This is a very personal bracelet, personalized as desired with her baptism or communion date. Includes sweet cross at the engraving bed. So personal! Set up your bracelet together: choose your charm and the bracelet that you like best. A truly personal and sweet gift for her birthday or special celebration. Beautifully packaged, equally ready to give. This is to personalize a very personal bracelet, completely satisfied with her first name, kind word or date. Lief .925 silver bracelet with two intertwined hearts, symbolizing the love between mamama and daughter. By-and-by sterling silver, so it will stay beautiful. Have you got the sweetest mommy in the whole world? Then this silver necklace is for you. 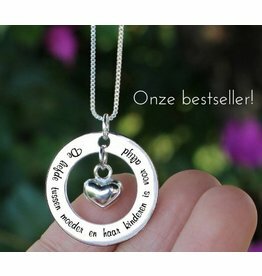 This beautiful text is engraved on a sterling silver pendant with a sphere of 22 millimeters silver heart, including chain. 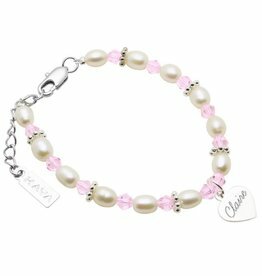 Make the child's bracelet entirely personal with a silver charm. For example, say 'I love you', 'kiss from mommy' or 'first grandchild. So you make the bracelet really finished. Dear children .925 silver necklace with a canary-yellow bird! Beautifully wrapped in a silk sieradenbuideltje, as ready to give. Shimmering pink Swarovski crystals change the white pearls out beautifully in this rosary. Completely tailor-made for children (60 cm) for baptism or communion. Delivered in a silk sieradenbuideltje, as ready to give. Make it more personal by this letter for her bracelet! The shimmering shell beads pearly come so beautiful with the beads and the initial charm. Beautiful and graceful for a little princess. This kids bracelet is beautiful in its simplicity. The shimmering pearly shell beads come so beautiful with the stars! Precisely without charms sweet, beautiful and graceful for a little princess. Luxury packed and evenly sent! 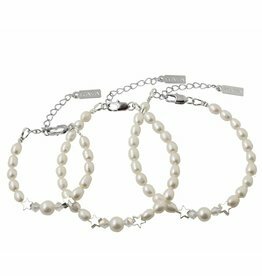 This luxurious double bracelet is a true ceremonial pieces: Glistening handmade ivory pearls change the white Swarovski crystals and cute little flowers off. On the bracelet hangs a glittering cross, symbolic sweetest girl! This .925 silver baby bracelet fits any jewelry box from a real princess. Made of through-and-through silver and studded with sparkling white cubic zirconia stones. Suitable from 6 years (14 cm) + 2 cm extension chain (up to 10 years). This children's bracelet is beautiful in its simplicity. The shimmering shell beads pearly come so beautiful with the beads and loving heart globe! Beautiful and graceful for a little princess. 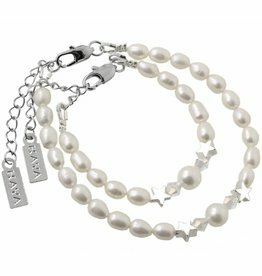 Wow, this pearl bracelet can show everyone that you belong together. 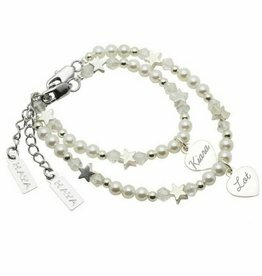 In the middle of the bracelet we string pearl a big round, surrounded by silver stars, Swarovski crystals and freshwater pearls. This kids bracelet is beautiful in its simplicity. The jet-black black onyx beads come so beautiful with the silver stars! Precisely without charms extra tough. Glittering gold plated star earrings for radiant girl. The stars are very nice fijntje (4 mm), of course with a very strong stekertje so it stays in place. What will they shine with these ceremonial pieces in her ear!